Home Perspectives What’s behind the U.S. stock market bust? What’s behind the U.S. stock market bust? In the last couple of weeks, the Dow-Jones index bounced like a wild horse that’s out of control. It closed at 23,190 before closing on last Friday, Feb. 9. The seesaw day on the market came after the Asian and European markets both closed in negative territory. Japan’s Nikkei 225 fell 508 points, or 2.32 percent, to 21,382, and China’s Shanghai composite sank 4.02 percent to 3,130. The Pan-European STOXX 600 was off 0.70 percent and Britain’s FTSE was down 34 points, or 0.49 percent. The Dow and S&P 500, which also soared to a record high of 2,872 on Jan. 26, have both pulled back more than 10 percent in the past two weeks. No one seems to know where the stock market is heading and why it took such a stomach-crunching nose-dive. 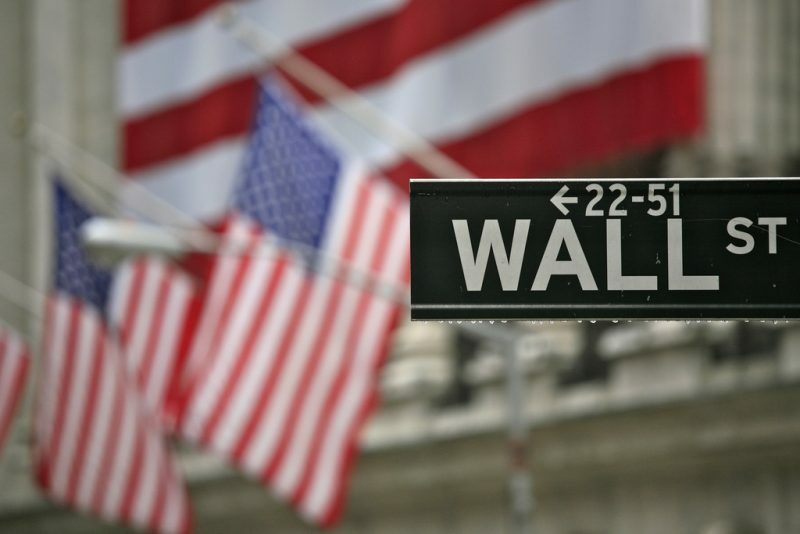 According to Yousef Abbasi, global market strategist for JonesTrading, the U.S. stock market has lost a whopping $3.1 trillion since the Dow hit a record high of 26,616 on Jan. 26. Some experts say that it was more like a necessary correction needed against an unsustainable growth that could not be explained away by the fundamentals. Others say that the topsy-turvy market was fueled by fear of inflation on the horizon, including whether rising wages and an increase in the number of jobs added to the economy will prompt the U.S. Federal Reserve to accelerate a rise in interest rates. 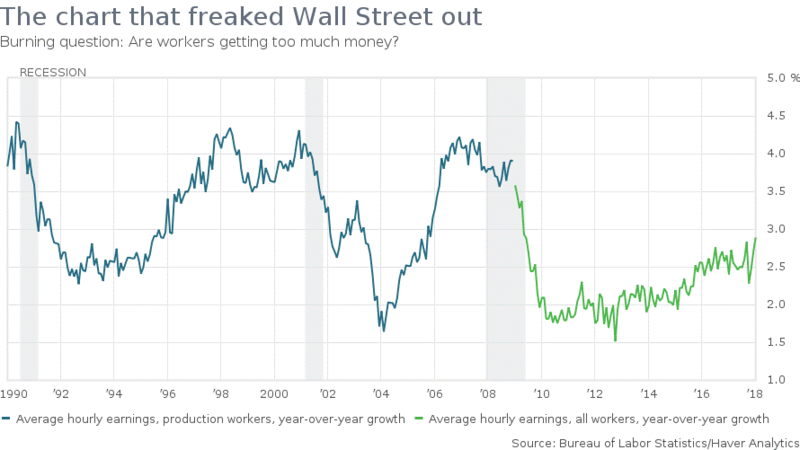 One of the catalysts for the recent selloff in the stock market was the report on Feb. 2 that average hourly earnings or wages had increased by 2.9% over the past year. This was the largest gain since the Great Recession, and it led to a lot of speculation that the Federal Reserve would have to raise interest rates a little more than expected this year to make sure that wages (and inflation) don’t go too high. New York Federal Reserve President Bill Dudley called the stock market drop “small potatoes”. A rise in bond yields combined with a fall in stock prices is a market adjustment to stronger global economic growth and correlating expectations that the Federal Reserve will continue to raise interest rates, he said. As noted by some experts, these days financial firms use computers programmed with complex sets of instructions known as algorithms. They identify trading opportunities and then strike faster than any human could. Algorithmic trading has become so ubiquitous that some estimate well over half of all trading of the S&P 500 Index is done this way. Such automated trading almost certainly accelerated the sell-off, which saw the Dow Jones Industrial Average crashing 800 points in ten minutes on Monday, Feb. 5. “The explosive speed of the fall … that is done by machines,” said Tom Stevenson, Investment Director at Fidelity Personal Investing. Most analysts, according to BBC, believe the market tumble was prompted by a report on the US job market, released on Feb. 2, which showed strong wage growth. But the decision to sell on that news may have been made by robot traders. US government bonds, or Treasuries, fell in value after the US jobs report. Yields (the interest that bonds offer investors) rise as prices fall. It’s thought that robot traders were waiting for that yield to hit 3% – a significant figure as it could prompt human investors to switch out of shares into bonds. She points to some other factors behind the wild ride that are worth sharing here. (1) Real productivity growth was surprisingly weak in the fourth quarter 2017 (down 0.1% from the prior quarter on a seasonally adjusted annual rate basis), and unit labor costs accelerated to 2.0% despite some moderation in real compensation growth. (2) The headline ISM Manufacturing Index moderated less than expected due to slowing supplier deliveries, while the production, new orders and employment indexes each declined. Meanwhile, the prices paid index increased to the highest level since 2011. (3) Labor market aggregate hours, which correlate with real economic output, declined 0.42% month-over-month in January, while average hourly earnings gained 0.3% month-over-month and rose 2.9% year-over-year — the highest rate since 2009. “These data come at a time when unemployment is below various estimates of the non-accelerating inflation rate of unemployment (NAIRU), broader measures of labor market underutilization are close to pre-crisis levels and payroll growth appears to have peaked for this cycle and is decelerating,” Wilding writes. Stock market’s behavior are known to mimic historical periods of accelerating inflation, slowing growth. While a range of indicators show that U.S. economic activity accelerated in the second half of 2017, the equity market deterioration is more in line with historical behavior during periods of accelerating inflation and slowing growth. It is interesting to note that while much blame has been put on the increase in hourly wage rate, which is only 2.9 percent, wages are growing barely faster than the inflation rate. In real terms (i.e., adjusted for inflation), through December wages were up just 0.6% year-over-year, down from 2.4% in October 2015, and 3.2% in the mid-1990s. According to Rex Nutting of the Market Watch, higher wage rates do not necessarily translate into inflation. Companies usually would raise prices when the fixed and variable costs are higher, and if they can afford to get away with it, but are usually forced to “eat” some or all of the increased costs, usually in the form of lower profits. He opines that higher wages aren’t putting pressure on companies to raise prices. After all, unit labor costs increased only 0.2% in 2017, one of the lowest gains ever recorded at this point in an expansion. According to the Bureau of Labor Statistics’ employment cost index, private-industry wages rose only 0.5% (after adjusting for price changes) in the past year. So, it is the fear of losing profit in stock funds and not higher wages that may be at the core of why Dow tumbled. As a matter of fact, U.S. workers have been losing bargaining power for decades, and the result is income stagnation for almost everybody except the fortunate few. Real median household incomes (adjusted for price changes) and real median weekly wages have barely budged since 2000. “Higher wages are exactly what the economy needs to keep the expansion going. Higher wages would lure more would-be workers back into the labor force. Higher wages would give companies an incentive to invest more in capital goods and services, which would, in turn, boost productivity and living standards. Higher wages would let more families to reach their dreams,” Nutting says. If the investors care about the growth of the American economy, they ought to share the American pie with low wage earners by increasing their wages fairly, and should not be freaked out with a 9-cent an hour wage raise. On the other hand, if they let fear and robots to dictate and feed their greed then, surely, they haven’t seen the worst yet. Finally, on a more serious note, as long as we live in a world of interest and paper money, away from dinar (gold) and dirham (silver), sadly, when it can be printed at the whim of a central bank or a government and not dictated by production of commodities, goods and services that others require, inflation will remain an untamed beast that would surely eat away our share of the pie. Something to ponder about! Return: sacred cow or dialogue?